Really, Embroidery has become one of the popular handicrafts among youngsters. Embroidery gives an amazing look to dresses and sarees. As shown up, there are different ways by which we can use Embroidery. The same piece of Embroidery used differently can bring a unique look to the items it is put on. 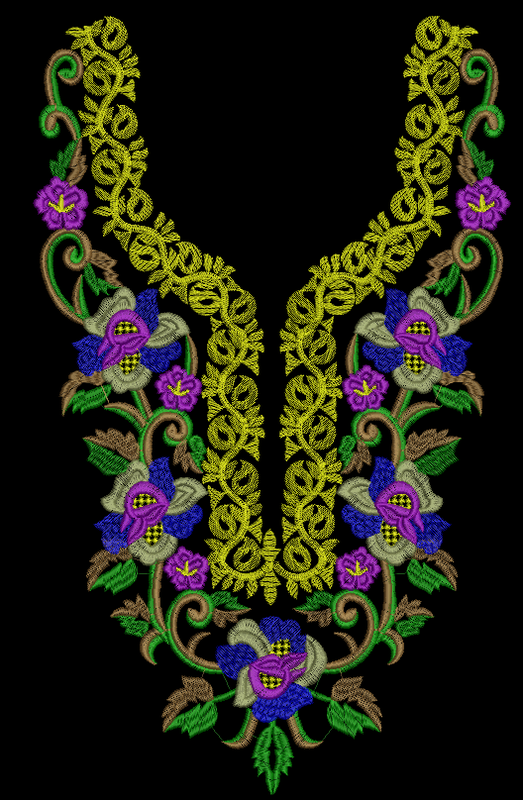 Embroidery Digitizing can make the work much easier. Any form of artwork can be converted into a digital format that can be understood by embroidery machines. These machines, then select the color and stitches mentioned in the input and the resultant output is the desired embroidery done on cloth. With the help of digitizing, people can now save the hours spent in creating embroidery on cloth. To know more about how Digitizing is affecting the Embroidery world and how you can use it to create attractive designs, you can refer to the following links. We are back with a design that can be used in various different manner. We think there is no need of speaking anything. The above three designs itself make everything understand. To download the design click on the above pic, it will redirect you to the design. We have increase the density of the first designs by 150%. Request you to adjust the density as per the requirement before using the design.